Washington Park Arboretum is one of the coolest public spaces in Seattle. 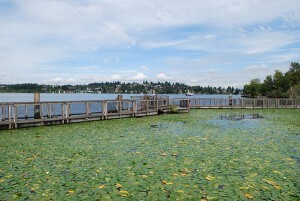 The 230 acre park, which is operated by the city and the University of Washington, features a botanical garden, fishing areas, several canoe and kayak landings, and plenty of hiking trails, including the unique Arboretum Waterfront Trail. There are two different ways to approach the half-mile Arboretum Waterfront Trail. You can park in the arboretum and walk west to East Montlake Park (about a 30 minute trek depending on where you park — I suggest the Foster Island parking lot), or you can park in the old Museum of History and Industry parking lot (2700 24th Ave. E.) and head east toward Washington Park Arboretum (about a 20 minute walk). So, what makes the Arboretum Waterfront Trail unique? Here’s the answer. 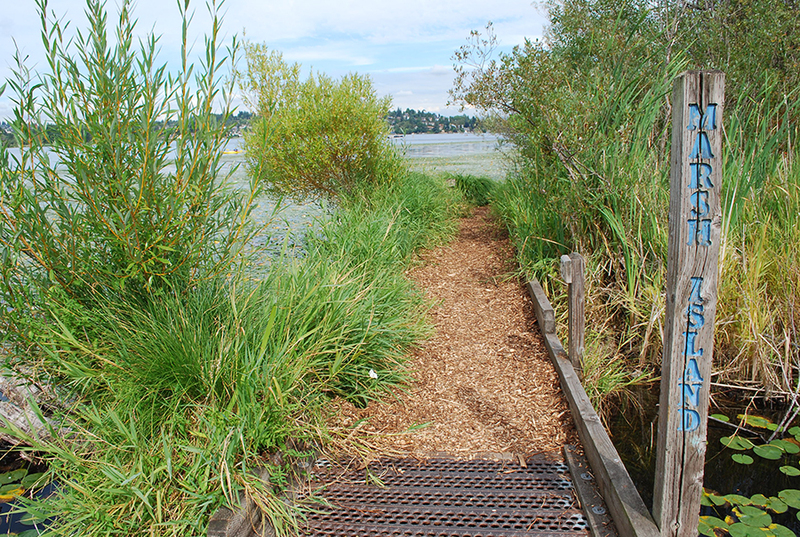 The trail leads you through and over the largest remaining wetland in Seattle. When I say over, I mean over. 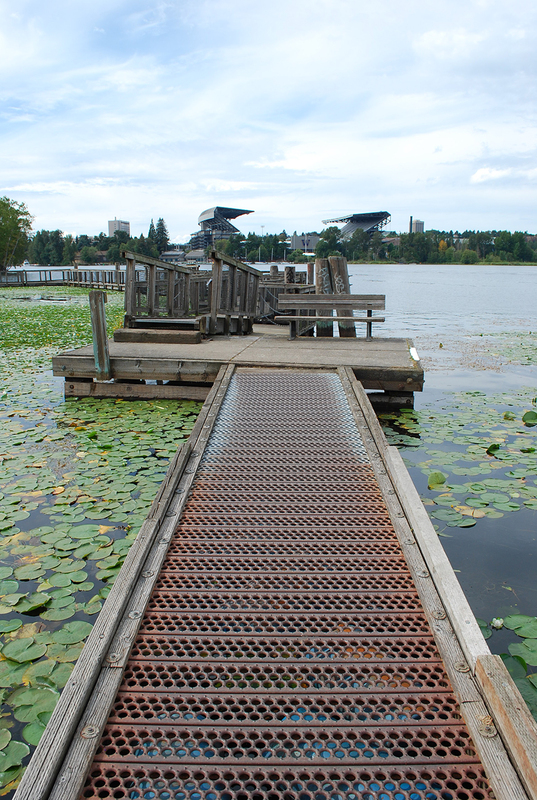 There’s literally a floating walkway that puts you on top of Lake Washington. The floating trail leads you through a maze of lily pads from Foster Island to Marsh Island and across to East Montlake Park (or vice versa). When you’re not on the floating walkway, you’re strutting through the wetland on a well-maintained bark path. 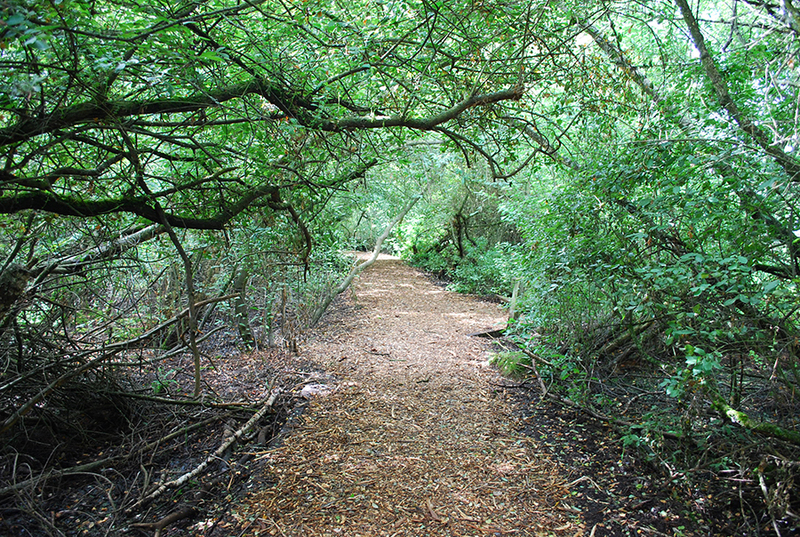 NOTE: Since the bark path leads through a wetland, the bark can often get soggy. In some cases, it can be downright sloppy. If you’re heading to the Arboretum Waterfront Trail after heavy rain — be forewarned. Tove and I have slogged through some nasty stuff on that trail in the spring. When you’re on the Arboretum Waterfront Trail, keep your eyes peeled for several different types of water fowl, red-winged blackbirds, marsh wrens, dragonflies and much more. The barked marsh trails “plunge you into a tangle of willow and birch, or bring you through dense bulrush and cattail marshes,” according to the trail’s sign (I’m not a wetlands expert, so I let the sign do the talking for me there). The wetland is a very fragile environment, so running, biking and dogs are not allowed on the Arboretum Waterfront Trail. With that said, I saw several people taking a jog along the floating walkway when I was most recently there. I also can’t imagine the trail being wheelchair accessible. 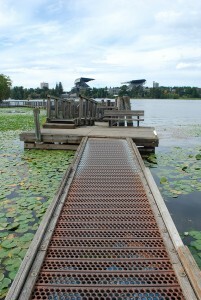 The bark path is bumpy and there are several small steps on the floating walkway. Even though you’re in an incredible wetland environment, you can’t expect serenity on the Arboretum Waterfront Trail. 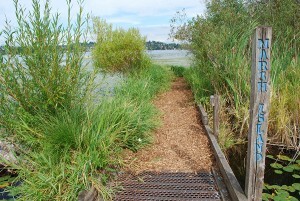 The path is right next to the 520 bridge and Union Bay on Lake Washington (the tail end of the Montlake Cut). That means there’s plenty of automobile and boat traffic nearby. There are also plenty of people paddling around the trail on canoes and kayaks. The Arboretum Waterfront Trail is easy for everyone. It’s a flat, half-mile trek in each direction. The wetlands atmosphere is really neat, but the real novelty (because I’m a 10-year-old trapped in a 30-year-old body) is strolling across the floating walkway. It’s a fun experience, especially on a warm day in Seattle. Have you ever walked along the Arboretum Waterfront Trail? How was your experience? We’d love to hear all about it. You can leave a comment below or connect with us on Facebook, Twitter and Google+. 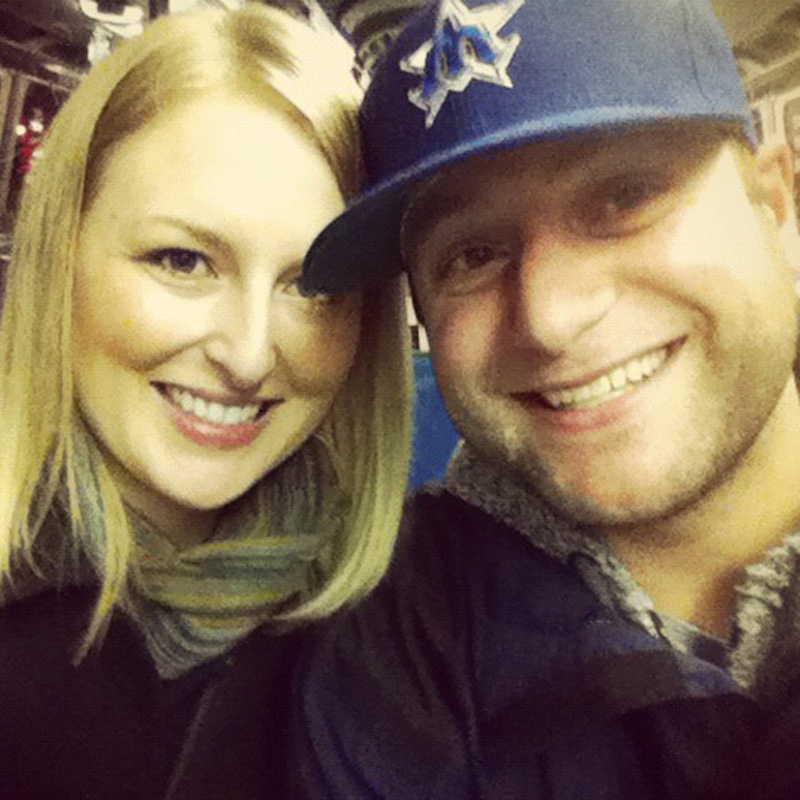 Don’t forget to also check out Seattle Bloggers for more great places to check out around the Emerald City and beyond. If “running, biking and dogs are not allowed on the Arboretum Waterfront Trail” when will the UW be placing signs along the trail stating this? Today (10.12.14) many runners repeatedly came up behind the group I was walking with without even the faintest “excuse me” as we jumped out of their way. Can’t imagine what runners do for the ducks! When will the UW put up notices per these rules? I know, never. I have at one point seen signs that had a runner with a red circle around it and a red dash across on both sides of the waterfront trail. Not sure if it is still there, even though I ran on that trail today. And have many times in the past. That said…. the “fragile environment” is harmed 100,000 times more by the construction of the new 520 bridge than by any runners. As any frequent user of that trail knows, it is not “under water / muddy after heavy rain”, but every spring when the US army corps of engineers raises the lake level by 2 feet or so. That, combined with the fact that the non-floating part of the trail slowly sinks into the bog. Also, I always slow down for walkers and say hello. There is space for all users to enjoy the trail, as long as everyone is courteous. According to a trip report on the Washington Trails Association website, the waterfront trail was open as of July 29th. I ran through there about a week ago, and it was open. I know it was closed a few weeks ago when they removed the temporary construction bridge. Not sure if any more closures are planned in the near future.